Fall is upon us, and in some parts of the country that means cooler weather and the leaves turning. It’s a great time of year to break out a cozy blanket, a good book, and park your posterior on the couch while the leaves of yellow, burnt orange and deep red are quietly falling to the ground outside. Fall also makes me think of pumpkins, apple picking and cider. 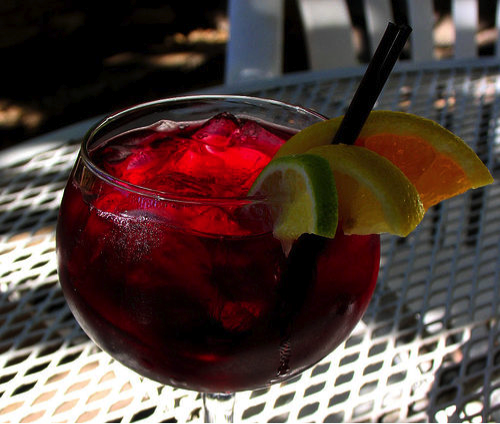 So my drink for this post is a cider sangria. I’ve been told you can drink this warm or cold, but I made mine to be chilled, and I made a double batch because I was trying it out on a group of unsuspecting friends. One bottle of red wine - I typically don’t drink red. I am a sweet white wine kind of gal, and the more I thought about it, I don’t see why you couldn’t use a moscato or reisling with this recipe and I’m going to try that next time. Pour the bottle of wine in a pitcher. Add the cider. Chop up the apple into small pieces (you can use more than one apple) and add it to the mix. In a small bowl mix ¼ cup very hot tap water with ¼ cup honey. Stir until the honey is completely dissolved. Add the mixture to the pitcher and stir. Add 2 dashes cinnamon and chill. I added ice to the glasses before pouring. I was a little hesitant with using the cinnamon but the hint of it in the taste was delicious, but don’t overdo it. The sangria was a hit and I will definitely make it again. I have read all of Lee Child’s books. I have this Thor-esqe image of Jack Reacher in my head as I read, as I am sure many other fans do. 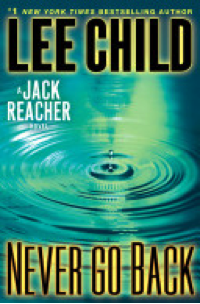 Never go Back is Lee’s newest edition to the Reacher saga. In a prior book, the current CO of the 110th MP, Major Susan Turner, helps Reacher out and he decides he likes her voice and would like to meet her. She currently holds the position he used to, using the same office he once sat in. In typically Reacher fashion, he spends weeks hitching rides across the country from South Dakota to just outside of Washington, D.C. to meet the woman behind the voice. Only when he arrives Major Turner is gone, and in her office is a light Colonel who tells Reacher he is being called back to duty, effective immediately, to face charges of murder for something that happened 16 years ago. Reacher is threatened and told to run, which is not in his makeup, so of course, he stays to fight and clear his name. I almost feel bad for the bad guys….almost. This book sounds great and I can't wait to try the sangria recipe. It sounds so totally yummy.